Do you want to be more like those people enjoying life and relaxing by a beautiful, unspoiled lake? And do you want to do so in a remote area with no-one else around to spoil your time there, all the while sipping on some fine whiskey or cooking some fresh fish you caught earlier in the day? It’s the kind of dream that many people assume only “pro” campers and hikers can turn into reality. The truth is, virtually anyone can enjoy such an experience in the great outdoors. Aside from knowing where to go, all you need is the right equipment for the job! As you can imagine, if you’re trekking alone, you want to carry as little as possible with you on your adventures. Of course, you need to have some decent shelter where you can feel safe and dry at night, and have your beauty sleep undisturbed. Lugging around a tent with you probably isn’t the best idea if you wish to travel light. The good news is that you can have tent-like shelter without the heavy weight to carry around. How is that possible, you might be wondering? Well, the answer is simple: you use a backpacking hammock perhaps in conjunction with a camping tarp. 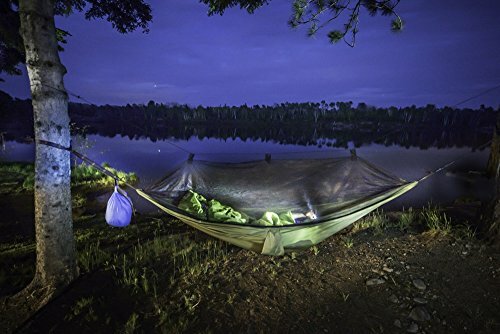 On this page, you can take a look at some camping hammock reviews of the Tiny Big Adventure Eclypse II, WildHorn Outfitters Outpost, and the TNH Outdoors Singlenest. Each product is tried and tested so that you can make an informed choice. But, is that a pledge it delivers? Let’s take a look at what it offers. For a start, the hammock weighs 16.7 ounces. Despite that low weight, Tiny Big Adventure claims that the next-generation RipStop nylon used in the Eclipse II’s construction is both sturdy and durable. It’s designed for a single person weighing up to 400 pounds, and it measures 108 inches long by 53 inches wide. The manufacturer is keen to emphasize that the RipStop nylon is significantly stronger than ordinary parachute nylon. So, what’s it like in real-world conditions? The good news is that you’re not going to end up falling through the nylon late at night in the wilderness! When examining the Eclypse II, you’ll notice that it features interlocking triple stitching at various load-bearing points. It’s also straightforward to set up thanks to the weight-tested hanging ropes. Plus, it comes with a waterproof clothing bag so that your gear stays dry while you sleep. The Tiny Big Adventure Eclypse II is perfect for those that want to try out sleeping in a hammock for the first time. Despite being the cheapest of the three products reviewed here, it’s still a good quality hammock and will survive several uses in the great outdoors. You also benefit from a six-month money-back guarantee for added peace of mind; something many hammock brands don’t generally offer. Next up in our review round-up is the Outpost by WildHorn Outfitters. 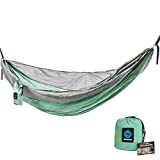 A mid-range hammock, this product is available in both single and double sizes, something that the Tiny Big Adventure Eclypse II does not boast. It comes with their “Litespeed suspension system” which features two 11-foot tree-friendly straps made with genuine Amsteel anchor rope. The buckle also offers the user an almost endless choice of hanging options, making it an ideal choice for most outdoors adventures. Using cinch buckles, it’s possible to have the Outpost fully set up in a matter of seconds rather than minutes or even hours! One of the advantages of the WildHorn Outfitters Outpost is how the polyester straps don’t stretch. The manufacturer claims they have been tested to 2,000 pounds. The hammock itself is made from 70D parachute nylon, rated to 400 pounds but tested to 1,000 lbs. Including the Litespeed suspension system, the WildHorn Outfitters Outpost hammock weighs in at a modest one pound and ten ounces. 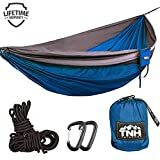 This triple-stitched hammock also comes with a stuff sack for ease of transportation, and has a packed weight of two pounds and three ounces. As a mid-range product, the WildHorn Outfitters Outpost hammock offers more benefits over the entry-level Tiny Big Adventure Eclypse II. For a start, it’s available in a double size, plus there is a range of colors to choose from. Regarding cost, the Outpost is reasonably priced and suitable for both infrequent and regular outdoors adventurers. Last, but not least in our hammock reviews is the TNH Outdoors Singlenest hammock. Priced at the premium end of the market, it’s highly recommended for serious outdoors explorers that want a long-lasting hammock. As with the WildHorn Outfitters Outpost, you can purchase a single or double-sized version and in an array of different colors. The included straps are 9-foot long and triple-stitched, and the double-sized hammock also features reflective straps. 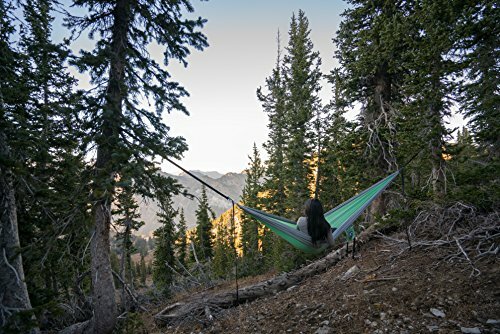 The double hammock measures 10 feet by 6-foot 6-inches, slightly shorter than the WildHorn Outfitters Outpost equivalent. However, it feels more comfortable for two people to sleep in. While it’s a shorter hammock than the WildHorn Outfitters Outpost, the TNH Outdoors Singlenest makes up for this with a well-built and well-designed product. The lifetime guarantee means that you aren’t limited to a specific time period in case something goes wrong with the hammock. The camping hammock that you should choose will ultimately depend on your requirements. If you are after a basic, low-cost hammock that won’t cause you to easily crash to the ground, the Tiny Big Adventure Eclypse II is for you. But, if you plan on exploring the great outdoors with your significant other, the WildHorn Outfitters Outpost and TNH Outdoors Singlenest are your available options. Both products are well-made, but the overall winner has to be the TNH Outdoors Singlenest. 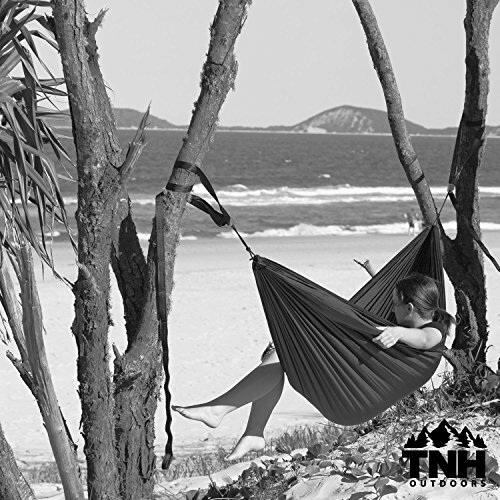 The TNH Outdoors Singlenest offers a lifetime guarantee and is made from premium materials seldom seen in the majority of hammocks. A close second is the WildHorn Outfitters Outpost, and while its material and build quality, and price is comparable to the Singlenest, the Outpost only has a three-month guarantee.